With a Cd value of 0.23, the 2014 Mercedes-Benz CLA sets a new benchmark for aerodynamics never seen before among all production vehicles. The new 2014 Mercedes-Benz CLA is truly as sleek as they come. Mercedes-Benz first designed the CLS whose design concept has produced a number of imitators since 2003 with its four-door coupe look. Now the all-new CLA mid-range four-door coupe gets even more stylish and sleek with record-breaking aerodynamics. The new CLA-Class combines its good looks and adds in never before seen aerodynamic efficiency. With a Cd value of 0.23, the new CLA sets a new benchmark, both within the Mercedes-Benz model range, and is the most aerodynamic vehicle on the planet. Mercedes says the drag area also leads the field, at 0.51 m². And while it may take an engineer to figure out, it all means the CLA is super sleek. And the CLA 180 BlueEffieciency Edition, which is available starting in June, is even more sleek with a Cd value of 0.22. And a new CLA Edition 1 will be limited and enticing. This makes the 2014 CLA-Class more streamlined than any other car ever produced. When Mercedes first introduced the Concept Style Coupe at Pebble Beach, the response was overwhelming and it was an instant hit. "The resonance created by the Concept Style Coupé was overwhelming. By far the most frequent comment heard was: 'please put this car into series production' And that's exactly what we're doing now", said Dr Dieter Zetsche, Chairman of the Board of Management of Daimler AG and Head of Mercedes-Benz Cars. "The CLA is a car that does not confuse mid‑range with mediocrity. Its powerful design underscores the sporty side of the Mercedes-Benz brand." Mercedes engineers improved the air flow over the new CLA by a number of different factors. These include a low A-pillar shoulder with adapted A-pillar geometry, aerodynamically optimized exterior mirrors, wheel trim designed for low aerodynamic drag and a specially-developed aero light-alloy wheel and serrated wheel spoilers on the front and rear wheel arches. Engineers developed the patented wheel spoiler with the help of airflow analysis. This component reduces undesirable air turbulence in the wheel arches and deflects the airflow from the wheels. The extensive use of underbody panelling, additional panelling in the middle area of the rear axle and an aerodynamically optimized rear silencer followed by a diffuser also improve the flow of air under the CLA’s underbody. Inside the cabin of the CLA, noise levels have been dropped, and the new CLA offers the lowest level of wind noise in its segment. Mercedes accomplished this by using frameless doors with a multi-stage sealing concept, a high insulating effect of the side windows and form-optimized exterior mirrors. This was all the result of information gathered in the wind tunnel and the use of fluorescent liquid to show where the wind flows and dirt collects. 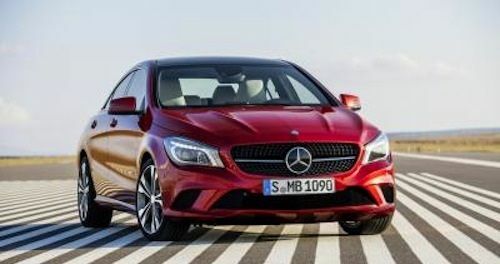 The all-new 2014 Mercedes-Benz CLA is the sleekest car on the planet and is the first car to be built exclusively at the new Mercedes-Benz production facilitiy in Kecskemét, Hungary. Look for the first sleek four-door coupe to be available in Germany in June.